Cooler night, cooler day. Saw the swan constellation last night. The sisters showed it to K and she showed it to me. Roof work continues. Small bathroom painted. Lots of hands on board today. Lots of lunch to provide. A man just walked off the street, in the front door without knocking, and handed me his business card for washing windows. Huh. A. has a swollen ankle, so he is training on his bike. He was fearing a huge uphill ride, essentially the Rim Trail of Taughannock Park which will burn. But, we'll see. I need to get to the Society of Illustrators LA show entries, 2 Christmas cards, more on the Glittering Tradition (refinements), a logo for 2300 degrees at 2300 hours, and two more related holiday designs. I am off the hook with the Tsunami project. I think my nice (not mean, really!) bullet pointed note about what we needed to do to get this job done may have moved it. And, the really nice thing is that I am still on their dancecard for other opportunities. So, I am very relieved as Project Atlas is moving forward with their own deadlines and expectations. 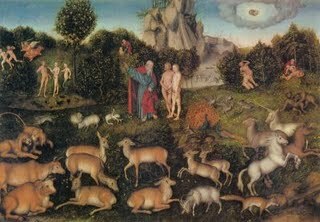 In the Garden of Eden story of the Biblical book of Genesis (Gen 2:4-3:26), God molds Adam from the dust of the Earth, then forms Eve from Adam's "side" (rib in the King James Version), and places them both in the garden, eastward in Eden. "Male and female he created them; and blessed them, and called their name Adam, ... " (Genesis 5:2) It may be allegorical, in as much as "Adam" may be a general term, like "Man" and refers to the whole of humankind. God charges Adam to tend the garden in which they live, and specifically commands Adam not to eat from the Tree of the Knowledge of Good and Evil. Eve is quizzed by the serpent why she avoids eating off this tree. In the dialogue between the two, Eve elaborates on the commandment not to eat of its fruit. She says that even if she touches the tree she will die. The serpent responds that she will not die, rather she would become like a god, knowing good and evil and persuades Eve to eat from the Tree of Knowledge of Good and Evil then Adam eats from it too. Then they become aware. God finds them, confronts them, and judges them for disobeying; it is also widely believed that the snake was the devil in disguise. It is at this point that 'God expels them from Eden', to keep Adam and Eve from partaking of the Tree of Life. The story says that God placed cherubim with an omnidirectional "flaming sword" to guard against any future entrance into the garden. Did I hear right? Omnidirectional Flaming Swords? Need to pick up A.